Motor protection circuit breaker AT-00, three-phase, 4-6 A Motor protection circuit breaker AT-00 with protection adjustment range 4 - 6 A. Automatic circuit breaker is designed mainly for protection of electric motors from overload or short circuit. List Price: 14.90лв. VAT Incl. Motor protection circuit breaker (АТ00) DZ518-M07C, three-phase, 1.6-2.5 A Motor protection circuit breaker AT-00 / DZ518-M07C with protection adjustment range 1.6-2.5 A. Automatic circuit breaker is designed mainly for protection of electric motors from overload or short circuit. List Price 35.00лв. VAT Incl. 33.25лв. VAT Incl. 31.50лв. VAT Incl. 29.75лв. VAT Incl. Motor protection circuit breaker GV2-M08, three-phase, 2.5-4 A Motor protection circuit breaker GV2-M08 with protection adjustment range 2.5-4 A. Automatic circuit breaker is designed mainly for protection of electric motors from overload or short circuit. Motor protection circuit breaker (АТ00) DZ518-M14, three-phase, 6-10 A Motor protection circuit breaker DZ518-M14 with protection adjustment range 6-10 A. Automatic circuit breaker is designed mainly for protection of electric motors from overload or short circuit. List Price: 35.00лв. VAT Incl. Motor protection circuit breaker (АТ00) DZ518-M16, three-phase, 9-14 A Motor protection circuit breaker DZ518-M16 with protection adjustment range 9-14 A. Automatic circuit breaker is designed mainly for protection of electric motors from overload or short circuit. Motor protection circuit breaker (AT00) DZ108-20, three-phase, 10-16 A, NO + NC, 6A/380VAC Motor protection circuit breaker DZ108-20 with protection adjustment range 10-16 A. Automatic circuit breaker is designed mainly for protection of electric motors from overload or short circuit. List Price 27.50лв. VAT Incl. 26.12лв. VAT Incl. 24.75лв. VAT Incl. 23.37лв. VAT Incl. Motor protection circuit breaker (АТ00) DZ518-M20, three-phase, 13-18 A Motor protection circuit breaker DZ518-M20 with protection adjustment range 13 - 18 А. Automatic circuit breaker is designed mainly for protection of electric motors from overload or short circuit. Motor protection circuit breaker (АТ00) DZ518-M21C, three-phase, 17-23 A Motor protection circuit breaker DZ518-M21C with protection adjustment range 17-23 A. Automatic circuit breaker is designed mainly for protection of electric motors from overload or short circuit. Price 24.50лв. VAT Incl. 23.28лв. VAT Incl. 22.05лв. VAT Incl. 20.83лв. VAT Incl. Motor protection circuit breaker (АТ00) DZ518-M22, three-phase, 20-25A Motor protection circuit breaker DZ518-M22 with protection adjustment range 20-25 A. Automatic circuit breaker is designed mainly for protection of electric motors from overload or short circuit. Motor protection circuit breaker GV2-M32, three-phase, 24-32 A Motor protection circuit breaker GV2-M32 with protection adjustment range 24-32 A. Automatic circuit breaker is designed mainly for protection of electric motors from overload or short circuit. Motor protection circuit breaker (AT00) DZ108-1, three-phase, 8-12.5 A, NO + NC, 6A/380VAC Motor protection circuit breaker DZ108-1 with protection adjustment range 8-12.5 A. Automatic circuit breaker is designed mainly for protection of electric motors from overload or short circuit. List Price 29.00лв. VAT Incl. 27.55лв. VAT Incl. 26.10лв. VAT Incl. 24.65лв. VAT Incl. Motor protection circuit breaker (AT00) DZ108-20, three-phase, 14-20 A, NO + NC, 6A/380VAC Motor protection DZ108-20 with protection range from 14 to 20 A. Built-in operating normally closed and normally open contact. The automatic circuit breaker is intended primarily to protect electric motors against overcurrent and short circuit. List Price 29.90лв. VAT Incl. 28.40лв. VAT Incl. 26.91лв. VAT Incl. 25.41лв. VAT Incl. Motor protection circuit breaker (AT00) DZ108-3, three-phase, 16-25 A Motor protection circuit breaker (АТ00) DZ108-3 with protection adjustment range 16-25 A. Automatic circuit breaker is designed mainly for protection of electric motors from overload or short circuit. List Price 32.90лв. VAT Incl. 31.25лв. VAT Incl. Motor Protection Circuit Breaker (AT00) DZ108-3, three-phase, 22-32 A Motor protection circuit breaker (АТ00) DZ108-3 with protection adjustment range 22-32 A. Automatic circuit breaker is designed mainly for protection of electric motors from overload or short circuit. List Price 36.00лв. VAT Incl. 34.20лв. VAT Incl. 32.40лв. VAT Incl. 30.60лв. VAT Incl. Motor protection circuit breaker AT-00, three-phase, 0.6-1 A Motor protection circuit breaker AT-00 with protection adjustment range 0.6-1 A. Automatic circuit breaker is designed mainly for protection of electric motors from overload or short circuit. List Price: 16.50лв. VAT Incl. Motor protection circuit breaker AT-00, three-phase, 16-21 A Motor protection circuit breaker AT-00 with protection adjustment range 16-21 A. Automatic circuit breaker is designed mainly for protection of electric motors from overload or short circuit. Motor protection circuit breaker AT-00, three-phase, 20-26 A Motor protection circuit breaker AT-00 with protection adjustment range 20-26 A. Automatic circuit breaker is designed mainly for protection of electric motors from overload or short circuit. List Price: 16.00лв. VAT Incl. Motor protection circuit breaker AT-00, three-phase, 19-26 A Motor protection circuit breaker AT-00 with protection adjustment range 19-26 A. Automatic circuit breaker is designed mainly for protection of electric motors from overload or short circuit. 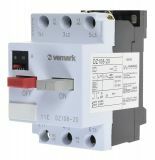 Motor protection circuit breaker GV2-М10, three-phase, 4-6.3 A Motor protection circuit breaker GV2-М10 with protection adjustment range 4-6.3 A. Automatic circuit breaker is designed mainly for protection of electric motors from overload or short circuit. Motor protection circuit breaker (AT00) 3VE1, three-phase, 1.6-2.5 A, NO + NC, 6 A / 380VAC Motor protection circuit breaker 3VE1 with protection adjustment range 1.6-2.5 A. 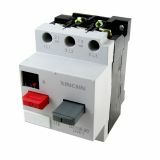 Automatic circuit breaker is designed mainly for protection of electric motors from overload or short circuit.